The Walking Dead season 8 returns February 24 – and we now know exactly what will be waiting for us on the other side of that Walker bite, thanks to these new images. 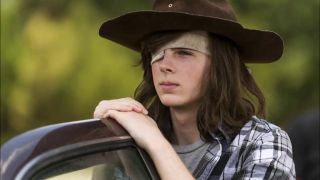 The shots show a different side to Carl, Michonne, and Rick than the ones we’re used to. Could they be hinting at a show willing to go in a completely different direction for its next eight episodes? The screens, taken from the premiere by TVLine, invariably focus on what went down in The Walking Dead season 8 mid-season finale. In it, Carl’s fate was sealed: you just don’t come back having a chunk taken out of you by the shambling undead. His serene look belies the ticking clock placed over his head, and he’s clearly writing something of importance. A Last Will and Testament, perhaps? I’ve got dibs on the cowboy hat. Elsewhere, Michonne and Rick have more immediate concerns. Namely, half of Alexandria is on fire. The sight of them holding fire extinguishers is a little goofy, but I see it as a nice act of symbolism, too. They’ve spent so long being firefighters for the group that the literal act of putting out one is left to them and them alone. Is Alexandria (and the show itself) putting too much on the shoulders of Richonne? It’d be an interesting path to go down, that’s for sure – especially if they want to phase either of the two main characters out. Alexandria surviving might be more shocking than Carl surviving at this stage; it looked well and truly done for the last time we saw it. The pair had better get a move on too. There’s no sign of Negan (yet) but you can bet he’s not far behind. The Walking Dead season 8 mid-season premiere is going to be killer. Not only will it be one of its longest episodes ever, it’ll hit you right in the feels too, according to the executive producer.